Looks like a lot of people wanted an orange Miata. The entire allotment of the 30th Anniversary Edition models, announced this morning, that were destined for the US have already sold out. To be fair, that’s the US market’s 500 units so you still might be able to get one, you’ll just have to import one of the other 2,500 from other markets. To get a sense of how quick that was, here’s an abridged timeline of today’s events. The press conference began at 11:30am Central Time, and ended just before noon. By 2:51pm, only 28 were left. At 2:55pm, all but 22 had been spoken for. Just five remained at 3:30pm, and at 3:50pm the pre-order site showed a whopping “2”. For reference, Mazda sold 11,294 Miatas in all of 2017 and 8,971 in 2018 . That’s an average of 747 or 941 per month. Of course, in winter sometimes the monthly total dips below the 500 mark. 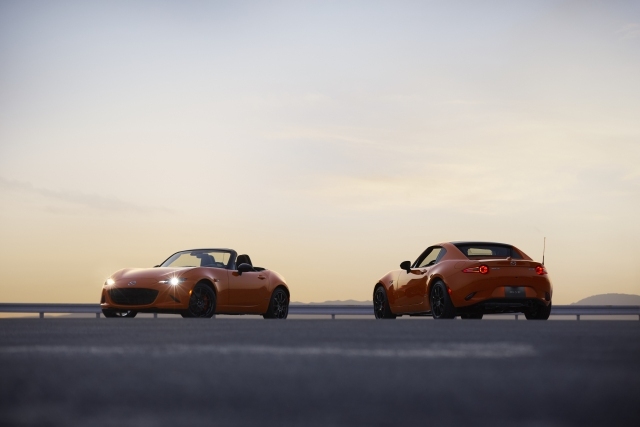 That means in one day Mazda sold more Miatas than it sometimes does in an entire December. So, when are they going to come out with a Renown green one to match? tagged: chicago auto show, mazda, miata, mx-5. Let’s do the math. Mazda has about 600 dealers in the U.S. 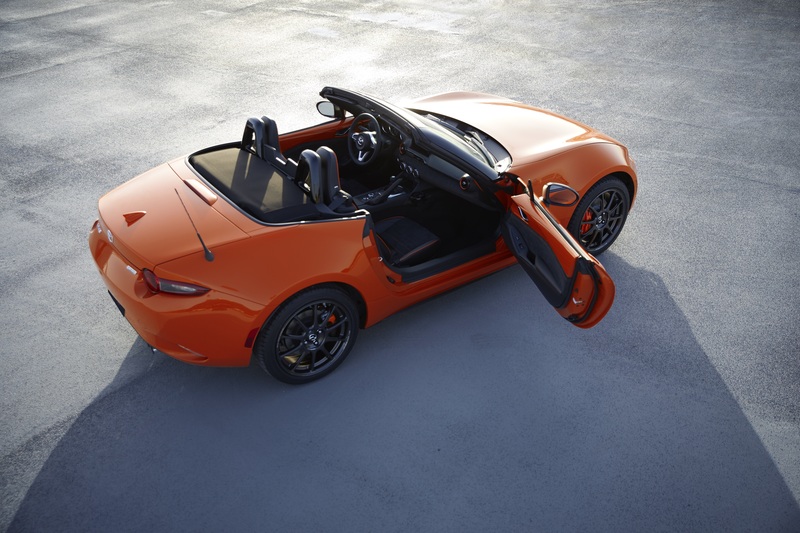 There are only 500 of these limited edition Miatas, so even if each dealer ordered and received one, some will not get any. 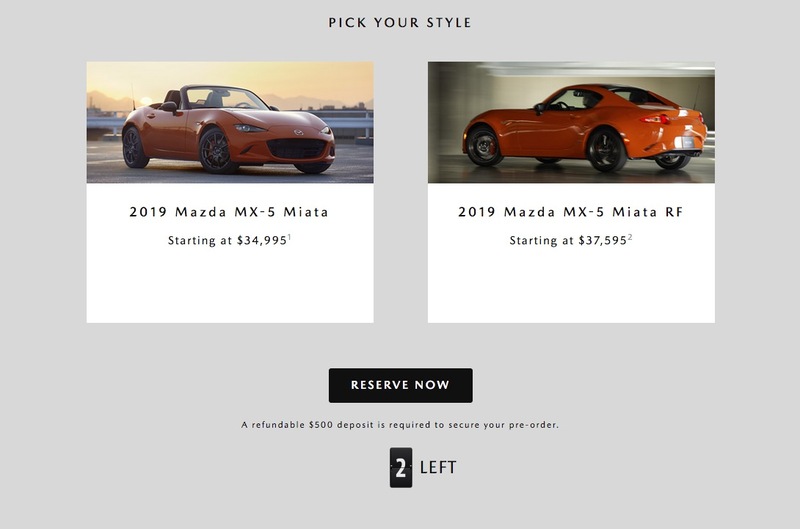 So don’t be surprised if you find an orange Miata at your local Mazda dealership with a ridiculous markup. I think anniversary and most other “special editions” are way overrated. When was the last time anyone cared about the anniversary Celica? Or Z? Or even the anniversary Corolla? Or even the Fahrenheit Golfs? Sure, the special edition Scion tCs are cool, but I wouldn’t expect to see one in a Mecum or Barrett-Jackson auction ever… Maybe a used car auction. I think it depends on how much the special/limited edition offers, and how much of the equipment is unique. In the case of this Miata it’s mainly the colour scheme and the wheels (since the Brembos, Recaros etc are available on the regular MX-5), as well as obviously the kudos of it being a special edition in the first place. A lot of manufacturers will release a special edition that’s literally *just* a new colour or some fancy trim, and that’s less worthwhile. Mazda’s own history has been hit and miss – the history of limited MX-5s seems to be split between those which are in different colours with maybe a sticker package, and others which have worthwhile mechanical upgrades and significant specification changes. And what is it with orange? Mini is coming out with a special “International Orange” Cooper, there was the special Scion tC, and the Fahrenheit Golf was also orange… At least the launch Supra wasn’t orange. I have to disagree Mark. I care greatly about the 50th AE Z. Soon as I spot a clean one “swoop” like a Hoover!